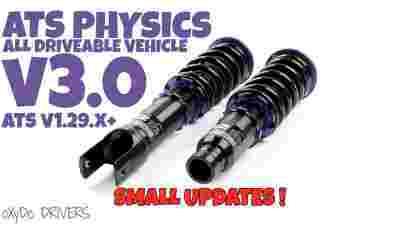 This physics change the transmission feel and suspension. V2.9: Every thing was redone from A to Z. Updated version of the physics folders. Suspension was redone on SCS trucks, Transmission, Tires slip are less then the 2.8, Everything has bean touch. Latest SCS physics update. V3.0: Suspension, truck cabin and transmission was reworked. Everything is done and tested with SCS 389. – Still in WIP ! The goal is that I want to make the “worst” physics to a “real feel” physics, I never drive a real truck in real life, but I can make it from Youtube Video. Recommended to use with a steering wheel and clutch pedal, but you can use this mod with other controlers !